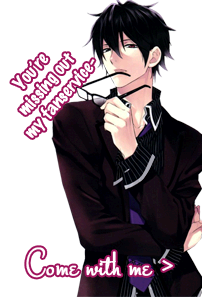 Any Voltage Otome Game Players Out There? Just had to ask because there are so many being translated and I have almost all of them on my iPod touch. If any of you have, what your favorite game and favorite guy? Love is an emotion that can heal and hurt. It can be passionate and emotional. It can empower and break a person. Love is an emotion one must never tool with. Re: Any Voltage Otome Game Players Out There? Yeah he does become a real sweetheart later on in his route....It just takes you two being stuck on a deserted island for that to happen XD Then he becomes all sweet yet mean to you, which I find cute. Haru, I think his name is? I want to play his route as well. My friend's doing his route right now, and she says he's unexpectedly sweet. I wouldn't be surprised if he was sweet, but I still want to find out for myself. I think it's kind of cool how depending on what guy you choose will effect what career choice the mc will decide on. I've only played In Your Arms Tonight. Unfortunately My Sweet Bodyguard likes to crash on my phone, so it seems I won't be able to play it any time soon. IYAT's Kippei Ebihara is definitely my favorite, though. Siiigh. In Your Arms Tonight seems to be the most mature one out of all their games, but I have to admit that I love Ebihara the most out of all of them too. I mean, the husbands route was nice, but he's still somewhat of a jerk in my eyes. Yeah, I played through Koichi's route too. Even though tried to make the reason for his affair more understandable, I still felt that it was kind of weak. u_u He's not very likable in my eyes, but I'll probably buy his Another Story if it ever comes out. Hopefully it'll change my view of him for the better. I'm really interested in getting Be My Princess and Celebrity Darling for Gree though...HAHAH what is social life and money. Lute's story was very sweet in my opinion. He's one of those kind of guys who tries to do his job and also fail at not falling for you. I know how you feel. :< It's really frustrating when you get stuck. I like that aspect, too! It brings more variety to the game, and certainly makes it more interesting. Though, I totally let the career choice affect which guy I chose, lol. Kerachan wrote: Lute's story was very sweet in my opinion. He's one of those kind of guys who tries to do his job and also fail at not falling for you. Isn't that all of the characters? ;D 'Cept for Haku who's literally aiming straight for the heart! I haven't played his yet tho so I wouldn't know. Which one has the little anime? I know Seduced had it's own little animation on Youtube, and IYAT has it's own now that it's switched formats but I haven't seen any for either of them. I didn't particularly go to Pirates in Love because the MC seems a little too stupid for my tastes. u___u I tend to stray away when that happens, even though someone can prove me wrong and tell me the other MCs are stupid too. I know so much about Voltage games vicariously through other players who constantly talk about them on another forum. I'm more into fantasy, but Voltage doesn't really do all that much fantasy... So many guys with suits. But I love Kiss of Revenge. Loved it ever since I played the Japanese version's prologue that I could not understand. XD;; I've played every Voltage games' prologues, at the very least. Regarding GREE, I like Be My Princess most. Though I have all the English GREE Voltage titles, I just don't like bodyguards and celebrities. But cute enough to read and I continue because almost feel an obligation to be up to date on happenings to answer every freaking question people have. I'm a Voltage fan, they are releasing tons now, including fantasy and stronger MC. I like Voltage! I play quite a few. I don't think their stories are always great, but they make a lot of guys that I really love. And when the MC sometimes has a backbone and stands up for herself, it makes me very happy! Luckily, they are coming out with a few more stories like that. Hi there! I'm also a fan of Voltage games. In Our Two Bedroom Story, I've gone through Minato, Shuusei and Chiaki. Chiaki was my favorite. You should try In Your Arms Tonight / Kiss of Revenge for drama. First love diaries / Dreamy Days in the West for something light hearted and cute. My Forged Wedding is also good. Until I get a new laptop, I've been playing mobile otome games. Most of them are voltage games. The first one I started with was 10 Days with My Devil. I originally wanted to play Shiki's route first, but I ended up starting with Kakeru. The storyline was okay. I just bought Shiki's bundle and I'm on the epilogue. He's so cute! Yay Ota is the best!!! I also really liked Mamoru.